“I just look at things and I see possibilities,” says Amy Rosenstein Lassman. After learning to sew from her mother around age 7, Amy Rosenstein Lassman progressed from creating her own doll clothes and outfits for her figure skating competitions to pillows and curtains. 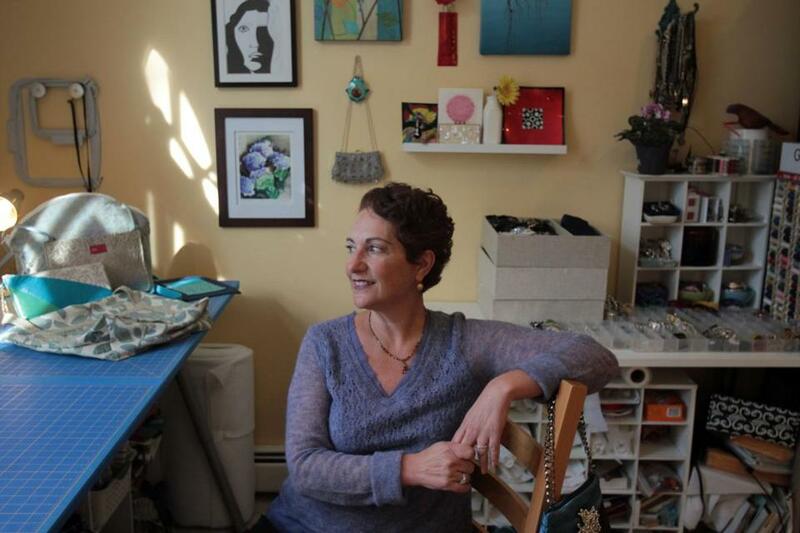 Now owner of Adar Design, based out of her home in Needham, Lassman works with new fabrics, vintage textiles, sentimental pieces, and found treasures to design handbags, Judaica, and infinity scarves. Q. What is the biggest challenge in creating wearable art? A. Everything out there has been done; everybody already has a scarf, a handbag, you name it. What sets my work apart is how I use different colors and fabrics to create something that wows. With a handbag, for example, I think everything should be personal, down to the gorgeous silk lining. My feeling is it’s an extension of who you are and how you want to present yourself to the world. Q. How did you get started in Judaica? A. I’m very involved in the Jewish community, and so I started making challah covers and bags to hold matzoh on the Passover Seder table. Then I took a basic yarmulke and added beading and embroidery, peacock feathers, plumes, and antique broaches. I love the handbags, but my heart goes into this work in a very different way. Q. Why are those pieces so important to you? A. This is custom work for the most part, so I have an incredible opportunity to become part of people’s lives. In the corner of a prayer shawl, I’ll stitch in a little pocket holding a piece of fabric from a baby blanket, or a grandfather’s tallit, or a grandmother’s wedding gown. Whenever you wear it for the rest of your life, you’ll have the memories of the people who loved you. Q. Do you ever run out of inspiration? A. The answer is no. I have so many fabrics that I had to take the doors off my closets, and I shop everywhere for beads, freshwater pearls, and other embellishments. I just look at things and I see possibilities. For more information, visit adardesigns.com. Cindy Cantrell may be contacted at cindycantrell20@gmail.com.